Dragonite impregnated with an essential oil in an LDPE masterbatch. 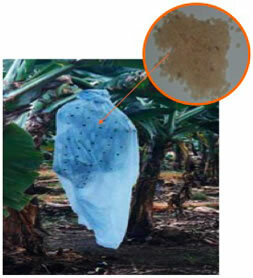 A clear LLDPE bag is loaded with 5.0% Dragonite which has been impregnated with an essential oil to create a clear polymer barrier with an ability to repel insects from tree crops throughout the length of the vulnerable growth cycle. Dragonite™ provides a natural, eco-friendly solution for a more direct and efficient delivery method of agricultural agents. Utilizing its inner lumen as a natural reservoir, Dragonite can load, store, and control-release a range of agricultural agents uniformly and in appropriate dosages. Dragonite release rates can be tuned to match the duration of a growth or reproductive cycle, eliminating the need for frequent spraying or application by the end-user. Dragonite safely stores the agricultural agent throughout the usage process and guards it from degradation by external influences. Additionally, handling is made safer for the end user as exposure to the agent is blocked. This more efficient method of application means customers can safely apply agents in lower amounts, prevent harmful environmental run-off, and reduce labor hours. All of these benefits translate into significant cost savings. Dragonite is an inert natural clay and is EPA 4A listed.